The Criminal Justice and Police Act 2001 amended the Police and Criminal Evidence Act 1984, providing the police in England and Wales with the power to retain Deoxyribonucleic Acid (DNA) samples and fingerprint records relating to individuals following acquittal at court or any other discontinuance of a case. The Criminal Justice Act 2003 amended the Police and Criminal Evidence Act 1984, providing the police in England and Wales with the additional power to take DNA samples and fingerprint records from all persons detained at a police station having been arrested for a recordable offence. 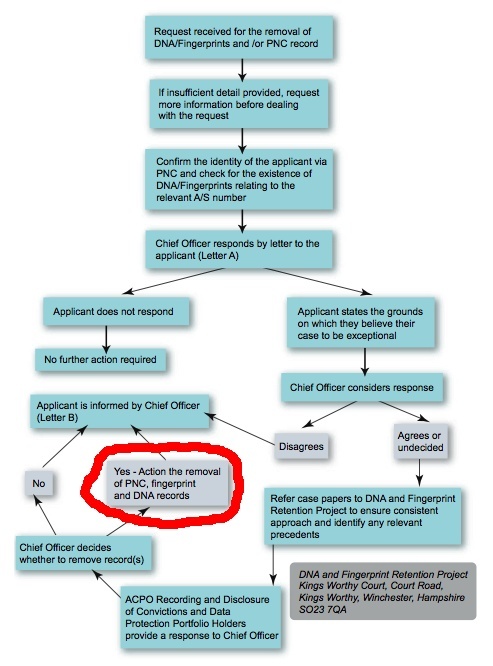 Both sets of legislation are permissive and, therefore, allow Chief Officers the opportunity, in exceptional circumstances, to exercise discretion and accede to requests from individuals for their DNA samples and fingerprint records to be destroyed, together with the deletion of the supporting entry on the Police National Computer (PNC). In December 2008 the European Court of Human Rights (Grand Chamber Judgement), found against the UK in that there has been a violation of Article 8 in respect of the retention of DNA samples and fingerprint records from persons suspected but not convicted. Although exceptional cases will be extremely rare the circumstances will be considered and a Commander from the Specialist Crime Directorate (SCD) will make the final decision on behalf of the Commissioner. They might include cases where the original arrest was found to be unlawful or inordinate. Additionally, where it is established beyond doubt that no offence existed, that might, having regard to all the circumstances, be viewed as an exceptional case. If you are one of the estimated 1,083,207 plus persons whose DNA profile is on the National DNA Database but who do not have a current conviction, caution, formal warning or reprimand recorded on PNC, head to the Reclaim your DNA website and follow the advice on how to proceed to make the police consider how exceptional your case is. Be persistent as by default the initial request for deletion is refused. The only positive of the current system is that if you succeed to have your case considered exceptional, then your Police National Computer (PNC) record will be destroyed as well as your fingerprints and DNA profile and samples. The Protection of Freedoms Bill does include measures to destroy the DNA of innocents, but lacks any provision to delete associated PNC records and photographs. Lobby your MP to improve this bill.